What Does A Construction Company Truly Need Out Of Their IT Support? In the construction industry, having the right tools for each and every project is critical. You outfit your workers with top quality equipment and materials because you know that doing things right the first time around will guarantee that your work holds up. So Why Not Take That Same Approach To Your Company's IT? 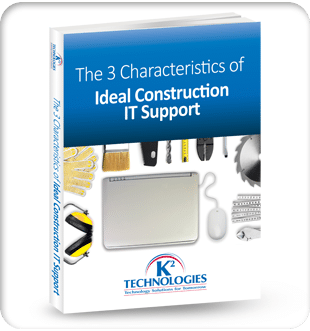 Fill out the quick form to the right to download your FREE copy of K2 Technologies' The 3 Characteristics of Ideal Construction IT Support and see how your current provider measures up. Sure, you can stick with your current IT company and keep dealing with your technology only when it gives you trouble… or, you could lay down a solid IT foundation on which to build your operations with help from an IT provider who can work with you every step of the way. YES! I WOULD LIKE to download MY FREE EBOOK. Privacy: K2 Technologies will keep your information safe and will not be given to third parties! Have questions? Contact K2 Technologies at info@k2technologies.net or (888) 686-3025. © 2018 K2 Technologies. All Rights Reserved.